Advertising has now permeated through our lives, from the traditional TV to the modern Internet. 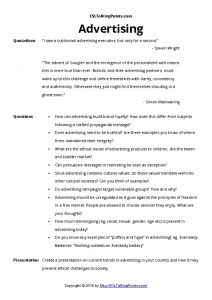 This advanced lesson focuses on how advertising has shaped us culturally and if it has also imparted cultural stereotypes. 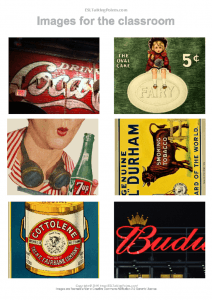 The images included can be used to discuss how advertising has changed over the last 100 years and encourage students to think about advertising’s influence on popular culture. How can advertising build brand loyalty? How does this differ from subjects following a crafted propaganda message? Does advertising need to be truthful? 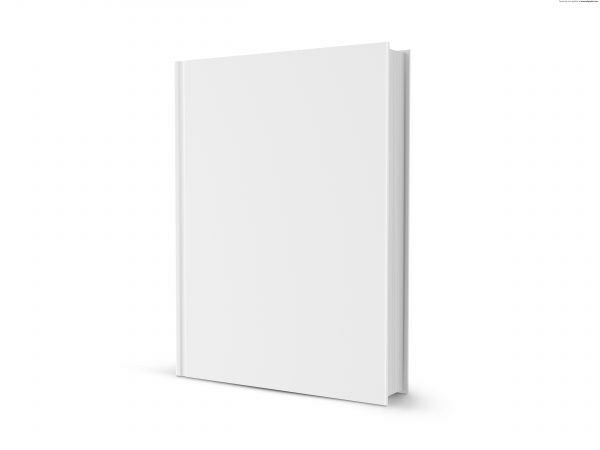 Are there examples you know of where firms maintained their integrity? What are the ethical issues of advertising products to children, like the tween and toddler market? Can persuasive messages in marketing be seen as deception? Since advertising contains cultural values, do these values translate well into other cultural societies? Can you think of examples? Do advertising campaigns target vulnerable groups? How and why? Advertising should be unregulated as it goes against the principles of freedom in a free market. People are allowed to choose services they enjoy. What are your thoughts? How much stereotyping (eg, racial, sexual, gender, age etc) is present in advertising today? Create a presentation on current trends in advertising in your country and how it may present ethical challenges to society.